Home@Centrestage – Calling all Students and Teachers! We are seeking teacher and student presenters for their views and experiences in exploring our built heritage at primary, secondary and tertiary levels (for presentations of about 10-15 mins each). 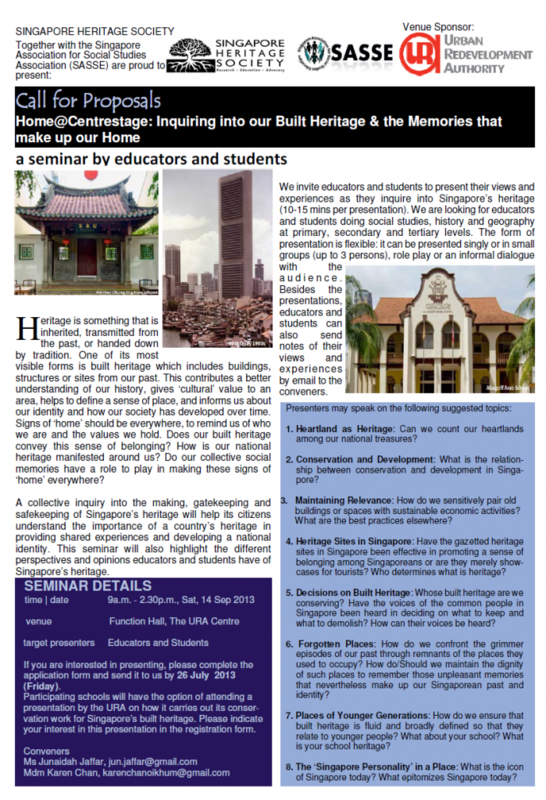 Presenters can speak on the following suggested topics: Heartland as Heritage, Conservation and Development, Heritage Sites in Singapore, Deciding on Heritage, Forgotten Places and Places of Younger Generations. More information and application form is available in HERE. A Word Document version of the application form is available HERE. The deadline for proposal submissions is 26 July 2013. The Seminar will be held on 14 September 2013 at the Function Hall, URA Centre.